QuickSet® offers Interoperability-as-a-Service across entertainment & smart home devices! Powered by a comprehensive device knowledge graph, automatically discovers devices in the home and uncovers information such as type, brand, model details, and control information. Recognition is done using device fingerprints across popular networks in the home including HDMI video networks, IP networks such as Wi-Fi, and other wireless networks used for entertainment control and home automation such as Zigbee rf4ce. Delivered as a managed service, breaks down the boundaries between entertainment and home automation devices. Interoperability is now a key factor in purchase decisions. Works across brands with what consumers care about, interacts with virtually every device within the home through a single point ( a universal remote control, a voice assistant, or a mobile application), enabled across multiple control mediums and protocols. QuickSet Cloud and native QuickSet SDKs deliver a complete framework for IoT Edge connectivity and management including secure cloud communications, remote access, offline scripting, rules and templates, and management dashboard modules. Network device cataloging and expanded monitoring capabilities also address the missing features in technical support tools. QuickSet is Universal Electronics’ software product family and the de facto solution for simplifying universal discovery, control, and interaction of devices within the home. First introduced in September 2009, QuickSet solution is a widely deployed technology powering major consumer electronic brands including set-top boxes, televisions, gaming consoles, smartphones, and tablets to enable effortless configuration and control of nearly any connected home entertainment device as well as an expanding range of popular home automation devices. QuickSet Cloud takes advantage of scalability and infinite processing power of the cloud platform. QuickSet discovery and control capabilities are available as simple web-based APIs enabling flexible integration, including server-to-server for cloud video delivery platforms, resource-constrained IoT devices, and cross-platform mobile applications. With a near real-time update cycle and access to the full device knowledge graph, this solution provides the best coverage, up-to-date features and highest accuracy. Native QuickSet SDKs jump-start the application development for mainstream platforms by offering QuickSet features as easy-to-integrate embedded APIs that perform complex logic in the background. Supports a range of platforms including Linux, Android, as well as optimized services for RDK and Android TV platforms. Built using QuickSet engines and leveraging QuickSet Cloud, it enables manufacturers and providers to build the best smart home and TV watching experience for consumers. nevo® is a digital assistant platform optimized for smart home applications, powered by QuickSet Cloud and offered as a white label solution to accelerate introduction of new services. QuickSet enables a Smart TV to automatically discover the content source devices and display them as another app or channel, and direct tune into content with a single touch. A Smart TV can also discover an expanded set of meta data from devices to provide a personalized experience, and interact with other smart home devices. QuickSet enabled set-top boxes remove the friction for the consumers to start watching TV without the overwhelming number of manual steps. With a single keypress or spoken command, it takes them to the desired content source, aka One Touch View. A set-top box can also act as a hub to access smart home devices combined with the entertainment service to provide a unified experience. QuickSet addresses fundamental shortcomings of today's voice assistants by providing the much-needed compatibility and context as it relates to existing installed base of devices within the home and their current status, such that a spoken word can take users to their desired content by putting the entire system in the configuration necessary to achieve that. As an example a ‘Watch Netflix’ command will turn on the TV, switch the input to the proper content source, launch Netflix application, and set lighting in the room to the movie scene. The solution you can trust and numbers to prove it! Want to ensure compatibility with the growing list of QuickSet powered devices? 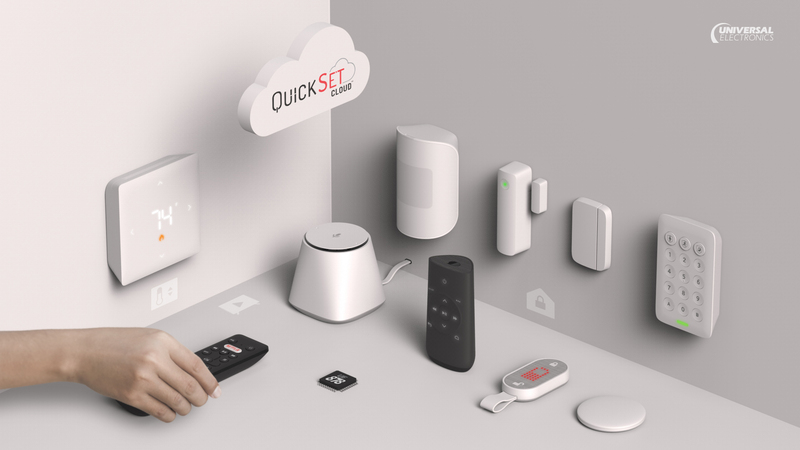 Works with QuickSet is a certification program for entertainment and smart home device manufacturers who want to ensure compatibility for their products in the home, and generate new revenue opportunities by expanding product offerings into new channels. The foundation of QuickSet is built on a set of Frameworks, Engines and Capabilities, through which QuickSet is able to offer powerful tools and services. QuickSet's foundation has become so powerful, and device network so big, that we're rolling out a "Works With QuickSet" certification program to ensure device compatibility and interoperability. A global device knowledge graph that provides device properties and meta data such as brand name, model and series information, manufacturer, current capabilities and offerings, their physical and software characteristics, compatible devices, region information, and much more. Automatically identifies connected devices by calculating fingerprints and matching the information against the device knowledge graph, across different interfaces including HDMI, IP, and Zigbee rf4ce networks without any user intervention. It returns a device object including device type, brand, model, and control information. Leverages the largest knowledge graph of devices to predict identity of a device and its associated attributes. Using its device fingerprinting technique and leveraging the constantly growing knowledge graph of devices, it extends the automatic discovery and control capabilities of QuickSet. Provides an optimized route for users to quickly search and narrow down the meta data and control information for their devices. Additionally, this engine includes a wizard driven process for setting up devices for a disconnected control point. Intelligent filtering, prioritization and model search capabilities based on market and location specific meta-data help in simplifying on-screen wizard to only what is relevant to the consumer, improving the user experience. Powered by QuickSet SDK, provides the basis of a unified interaction with HDMI devices. It handles the complexities of interacting with HDMI network and IR drivers on the host device and automatically sets up the control point to control the target device utilizing a unified interface for the transfer of data and control messages between connected devices. Powered by QuickSet SDK, it discovers rf4ce capable devices through multiple signatures including Zigbee rf4ce and configures the control point for non-line-of-sight (NLOS) control of devices. Exclusively available when used with UE878, UEI’s Multi-protocol QuickSet Certified chip platform. Powered by QuickSet SDK, has built-in support for dotdot over Zigbee 3.0 devices to make it a full featured framework for connected home, bringing smart home applications to any device running QuickSet. Exclusively available when used with UE878 - UEI’s Multi-protocol QuickSet Certified chip platform. Powered by QuickSet SDK, enables discovery and control of networked entertainment and home automation devices and their contents and services using standard and proprietary data transmitted over the IP network. Tracks the state of devices from connectivity, online or offline, to active content, to power status and other useful information, while also providing a history of actions executed for easy navigation across devices and content and many more use cases. Powered by QuickSet SDK, enables cloud integration for entertainment and smart home services including authentication, control and automation. Cloud integration extends QuickSet capabilities to include different integration options required in smart home applications, from LAN to Cloud. With over 90% of Air Conditioners still controlled through Infrared, this engine enables control of state-driven, commonly not connected air conditioners within the home. Powered by the largest database of infrared codes, at each step the engine executes all the required commands to put the air conditioner in the desired state; from fan speed to temperature and many more HVAC functions. A complete IoT messaging framework integrated in QuickSet Cloud and QuickSet SDK, enabling secure, bi-directional communication between connected devices and cloud applications. Multiple messaging patterns are supported to address a wide range of use cases such as secure remote access, monitoring and automation from the cloud. Integrated in QuickSet SDK, a complete virtual machine based framework for delivering automation and interoperability to capable IoT Edge devices, including cross-platform scripting capabilities, and control engines across many common interfaces used in entertainment and smart home devices. Capable of delivering the intelligence needed even when device is offline. Addressing most common use cases, automatic generation and management of optimized activities based on templates, including One Touch View to enable users to instantly access the desired content, app, or device with a single command, regardless of current state of the set-top box, TV or connected media device(s). Unlike many of the solutions on the market today, this must-have engine is not limited to a single protocol, and can deliver a continuous experience across entertainment and smart home devices. Interoperability with other devices and services in the home is delivered as a service with the controls needed to manage the brand experience. Provides the services necessary not only to interact with other devices within the home, but also delivers compatibility with other ecosystems such as hubs and assistants, while removing the burden of implementing and maintaining this growing list of compatibility requirements from OEMs. Enables secure remote access to your connected devices, built on a reliable IoT messaging framework. This is used in many core applications such as to provide remote control or access to consumers through a mobile application, or in service oriented scenarios remote assistance by technical support teams. A full-featured device management cloud system that provides a powerful dashboard for managing device virtualization, templates, properties, rules and schedules. It also provides device management tools and framework for monitoring device fleet health and status. Extends system configuration (including discovered devices and smart activities) to a secondary screen or control point. Allows synchronization across mobile devices, or mobile device with compatible Smart TV or Set-Top box, based on enhanced configuration format, including activities and labels. QuickSet implements a unique fingerprinting approach to identify devices based on non-structured and non-standard datasets. It identifies a range of device information, from device type, brand, model, control information and more. Uses various device signatures across HDMI, IP, and Zigbee rf4ce networks as an input. Calculates a series of device fingerprints and matches them against UEI's device knowledge graph to identify details about the device such as device type, brand, model, control information. It then merges the results across the multiple networks and returns a device object to the host application. This engine extends the automatic discovery and control capabilities of QuickSet to intelligently predict the device features and capabilities with varying levels of confidence. In providing a unified solution for today's home, in addition to device identification and control information, deeper device attributes also matter. Attributes such as supported protocols, native applications, or the Service Provider. These attributes are exposed through Predictive Engine. Calculates a series of device fingerprints to traverse the largest knowledge graph of devices. Using multiple machine learning models and finds different device attributes with varying levels of confidence. Returns an output with a prioritized list of probable device features and capabilities. This engine manages and automates activity setup by utilizing the Activity Engine and serves up a list of available activities to the host. Another feature of this engine is Dynamic Key Mapping – remote or touchscreen buttons automatically map to appropriate devices based on the active content source device. As an example: volume keys are mapped to the sound bar and channel keys are mapped to the Set-Top Box in a Watch TV activity. This engine requires connectivity to QuickSet Cloud and is only available through QuickSet SDK and with UE878, UEI’s Multi-protocol chip platform. This engine utilizes the results of Discovery Engine and Predictive Engine to identify the capabilities of the device. It uses the information retrieved to send and receive proprietary data packets over Zigbee rf4ce network to establish communication with the target device. Once communication is established and verified, it configures the UE878 control point to communicate and control the device through this medium. This engine requires connectivity to QuickSet Cloud and is only available through QuickSet SDK. This engine sends and receives standard and proprietary data over IP network; it then leverages the Predictive Engine to identify devices, including the specific standard and protocol they use for communication over IP network, as well as services offered by these devices. Irrespective of the underlying protocol, it provides a unified interface for the host application to retrieve device information and execute commands against the devices. This engine also tracks the state of all devices, from online status to current playing content. The host application can subscribe to be notified for any changes in the device status. Complex air conditioning is a state-driven device. Most keys have multiple states and multiple values associated with them. This engine dynamically generates each key at the runtime based on current state. Additionally, to track and provide the current state of these devices, this engine utilizes a state machine to track all the keys that have been executed. Optimized Setup Maps(OSM): OSM uses sophisticated algorithms to arrive at the best control information by testing just a few keys, and narrowing down the list of eligible control information for a device. To utilize this module, the control point needs to have two-way communication with QuickSet. Wizard Driven Search: A wizard-driven approach helps users get to control information for a specific device. This manual approach is mainly used when the control point does not have two-way communication with QuickSet, such as, the support site for a manufacturer or provider where users can go on to lookup control information about devices they want to setup. Please contact your account representative from Universal Electronics to request access to QuickSet Cloud Developer Portal. We will then set up the account with the appropriate project information and send you the credentials and an invitation to get started. If you do not have an assigned representative, contact us here and we will help make the introductions.